Gracias a Columbia GSAPP Urban Design por proveer la traducción de la columna de Sebastián Delpino D. en inglés. La hemos publicado con el fin de abrir parte de nuestra cultura de paisaje a la discusión internacional. Agradecemos especialmente a los colaboradores de este proyecto, que se ha construido con la motivación desinteresada de todos sus participantes. Equipo Editorial / Thanks for Columbia GSAPP Urban Design for providing the translation. Carretera Austral [The Southern Highway] has not only been fundamental for the economic development of the Aysén Region but also for the transformation of its landscape, by means of interventions associated with the industrial production of raw materials and its revaluation as national heritage. To understand this piece of road infrastructure and approach it as a system capable of configuring a region, it is necessary to know its history, its context, and its bases for the development of a plan of action, which promote tourism, and benefit those who inhabit this region. The road known today as “Carretera Austral” (Southern Highway, Road CH-7) and other roads that are connected to it, have contributed to the economic development of the Aysén region for more than a century. The first development section was started in 1903 along the Simpson River, with the purpose of transporting raw materials to Estancia Coyhaique, owned by the Sociedad Industrial de Aysén (S.I.A.) and Puerto Aysén, the place where the wool exported to Europe was shipped from. This activity was the trigger of its construction, initiating a land connection process based on the need for export. The European population of the region was propitiated thanks to the “Law of Repatriation of the Resident Settlers in the Republic of Argentina” enacted in 1896. This law contemplated the reincorporation of the settlers who had left their countries in search of development opportunities. Thus, in order to effectively occupy inhospitable areas, lands were offered to the ones open to such opportunity to encourage repatriation of remote places such as Aysén, which at that time was called “the promised land.” In other words, lands were given for economic development purposes, with which the state achieved the settlement of extreme territories as a way of “building the homeland,” and expanding and controlling national territory (1). The “estancias” were defined as the territorial unit of a socioeconomic system and were the fundamental drive for boosting regional productive activity. At the beginning of the twentieth century, the most important area in production capacity was Estancia Coyhaique, which promoted the construction of the first section of the Southern Highway as described above. Its public use was implemented in 1906, as explained by a historian Mateo Martinic: “This first expression of the future territorial road infrastructure was declared for public use by the Supreme Government on February 5, 1906, when it became known that the S.I.A. had prevented its use by people from the Sociedad Ganadera de los Tres Valles” (2). Thus, the development of the Southern Highway began its expansion in function of the need to transport raw materials for exportation and in order to strengthen the connectivity of the region at the same time. The first layout of the road was designed departing from a port located at the current Puerto Aysén, the city that became the regional capital around 1920. The productive activity resulted in the building of a railway between Coyhaique and Aysén for industrial transportation. Since the beginning of the twentieth century, the construction process of this infrastructure was undertaken without regulation regarding its effects on the territory, which resulted, among other things, in the indiscriminate burning of native forests for their transformation into productive estancias. Forest burning was conducted to provide open fields for livestock, agriculture, and industry development, the fundamental economic engine of the region at the time. The environmental consequences, unsuspected at that moment, were that many of these man-made fires expanded uncontrollably for months, causing thousands of hectares of native forests to disappear—the Simpson River Valley being one of its most conspicuous examples. In 1952, the General Administration of Aysén was generated in order to correct the forest situation. It recognized the defects of Laws No. 4,855 and 6,035 concerning settlement, admitting that they failed to regulate the burning of land for productive purposes–clearing maneuvers that had already taken an appalling character according to the local records of the time (3). Deeper into the second half of the twentieth century, the State began to contribute resources to the expansion of the highway in order to promote livestock and agricultural industries, under the understanding that the Southern Highway would have the capacity to consolidate and promote the economic development of the region. During the presidency of Eduardo Frei Montalva (1964-70), the Southern Highway was understood as a piece of political-economic infrastructure, and considered a way of building the homeland: by settling and colonizing an extreme region. During the government of Salvador Allende (1970-73), unsuccessful efforts were taken to consolidate the area into a regional system. Later, during the dictatorship and military regime of Augusto Pinochet (1973-90), the highway expansion was continued as a way of controlling the territory. It was in this period that the Ministry of Public Works (MOP) intended to consolidate the highway into a regional system but not simply as a sum of sections connecting different populated centers or estancias, as it was hitherto considered. The works to execute this plan are still ongoing today under the direction of the MOP, turning 114 years of construction this year. So far, the materializing process of the road as an infrastructure has been approached, and its impact on the landscape has been outlined, as a work capable of re-signifying the territory from economic, social, and ecological points of view. And it is the road’s capacity to raise a new landscape what conveys meaning in the words of the U.S. Army intelligence officer, editor, and professor John Brinckerhoff Jackson: “Roads no longer simply lead to places, they are places. And, as always, they play two important roles: as promoters of growth and dispersion, and as magnets around which new types of development can cluster. No other space in the modern landscape is so versatile” (4). A product of the public and private work which more than a century ago was aimed at the economic development of the livestock industry in the region of Aysén, the highway today is seen as a space with high touristic and economic potential. Fueled by a variety of landscapes with wide uncorrupted natural areas and therefore of great scenic attractiveness, this road is able to construct an important part of the local cultural narrative, and thus constitute an historical and political record of the whole region. Projects are currently taken under evaluation such as the stretch that will connect the Region of the Lakes with the Region of Aysén, the sea route from Aysén to Puerto Natales, and the questioned route that crosses the Southern Ice Fields in that same region. It is precisely the cultural and landscape heritage that in these and future expansions of the highway must be addressed as a local treasure to be exploited and revealed, to avoid the ecological disasters that occurred in the past and the degradation of an important part of the natural heritage of the region, by placing this natural heritage at the forefront and as catalyst of any regional infrastructure plans. Understanding and approaching this piece of road infrastructure from its spatiality, its possibility to transform the physical environment, and its potential to fulfill the history, allows us to explore a landscape which in some sections hides productive processes, currently consolidated as cultural, and in others reveals enormous territorial extensions of untamed nature and extraordinary wilderness. In the encounter of both landscapes, the cultural heritage is revealed: built from the road as a story through new initiatives and projects, it expects to be given value. Sebastián Delpino Donoso. Architect at Diego Portales University, and Master in Architecture and Urban Design at Columbia University (New York). He currently focuses on developing infrastructure, landscape and public space projects. He is also a professor of the third-year workshop in the School of Architecture at the Diego Portales University. (1) Extracted from El Mercurio de Valparaiso in 1885 in MARTINIC, Mateo. De la Trapananda al Aysén, (Santiago: Pehuén Editores, 2005), p. 163. (2) MARTINIC, Mateo. De la Trapananda al Aysén, (Santiago: Pehuén Editores, 2005), p. 134. (3) MARTINIC, Mateo. De la Trapananda al Aysén, (Santiago: Pehuén Editores, 2005), p. 502. (4) BRINCKERHOFF JACKSON, John. Las Carreteras forman parte del paisaje, (Barcelona: GG, 2011), p. 10-11. (1) “Settling occupation 1900-40” in MARTINIC, Mateo. De la Trapananda al Aysén, (Santiago, 2nd Edition, Pehuén Editores, 2005), p. 401. (2) Situation of Aysén 1940-45 in MARTINIC, Mateo. De la Trapananda al Aysén, (Santiago: 2nd Edition, Pehuén Editores, 2005), p. 595. (3) Transport of wool by truck from Coyhaique to Puerto Aysén around 1940 in MARTINIC, Mateo. De la Trapananda al Aysén, (Santiago: 2nd Edition, Pehuén Editores, 2005), p. 879. 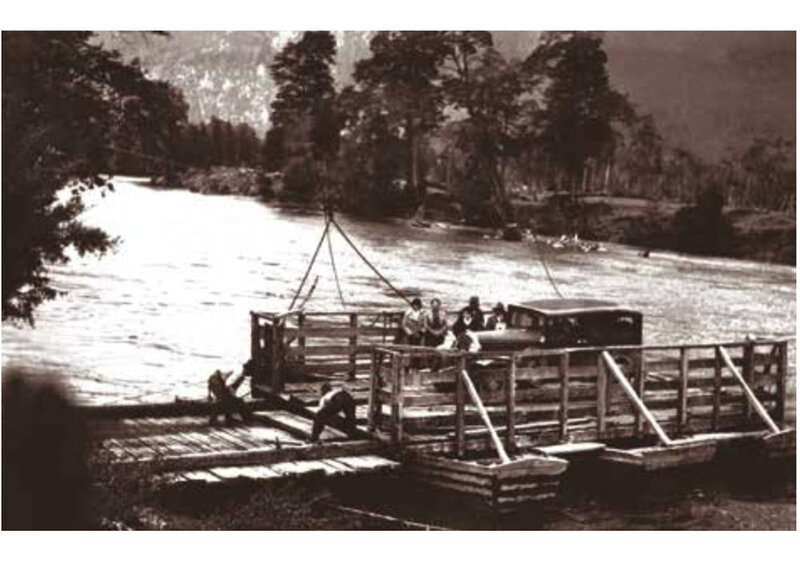 (4) The raft service on the Aysén road - Coyhaique around 1930 in MARTINIC, Mateo. De la Trapananda al Aysén, (Santiago: 2nd Edition, Pehuén Editores, 2005), p. 876. (5) Road CH-7 (Southern Highway) 2016, © Sebastián Delpino Donoso for LOFscapes.